Good Morning Onward Nation…I’m Stephen Woessner…and welcome to this week’s solocast…Episode 450. I am excited to be back here with you — because — when you apply the lessons we cover today — you will change the game for your business. I promise you — what you learn in this episode can be that impactful for you, your business, and your revenue. I decided to record another revenue-focused solocast this week for several important reasons. First…last week’s solocast where we drilled deep into how to monetize a podcast was one of our highest downloaded solocasts – ever! Rock solid awesome and we received some wonderful feedback, Onward Nation – thank you for that. I am so happy you found the strategies and step-by-step process within last week’s monetization the lessons to be helpful. And second…I have been giving a lot of thought recently to my life’s purpose. I know – big topic. But I have been giving deep consider to what kind of problems I really enjoy solving – where do I really love creating impact – and what kind of impact do I find the most rewarding? Just in full transparency, Onward Nation…I have done a lot of soul searching on these questions during the last several months…and have found some very powerful perspective and themes emerging and they really strike a cord with me. For example, I realized that helping small business owners is not only something I enjoy doing and find super rewarding – but – I have been in the trenches…on the front lines helping small business owners grow their companies over the last 23-years. When I took some time to think about some of those experiences – it brings a smile to my face. But aside from the joy and personal satisfaction – I realized that my drive for helping small business owners goes deeper – like all the way to my DNA. I have owned five small businesses, with Predictive ROI being my fifth company, but love of entrepreneurship is something I learned while growing up in my Aunt and Uncle’s restaurants and my mom’s bakery and catering business back in Canton, Ohio. Go Buckeyes! Had to sneak that in there. But it goes even deeper still. It goes back another generation to my grandfather who came to the United States from Istanbul, Turkey as a Greek immigrant who couldn’t speak the language…he had no money…he didn’t have a robust LinkedIn account…or a thriving YouTube channel…he had no social circle. But what he did have was incredible work ethic, he had grit, and he had a truckload of tenacity. And in 1926 – just six years after my grandfather arrived in the U.S…he had saved enough money working on the night shift at a downtown Canton, Ohio restaurant to be able to open his own place, which he called The Ideal. Just two years before the Great Depression. But, my Pop survived — our family survived – and helped his customers survive, too – by giving away more homemade soup than he ever sold. He believed so strongly in taking care of his customers because they would take care of him in return. And they did. So, Onward Nation – the reason I love small business owners as much as I do is because I have tremendous respect for the 28 million owners in this country who are grinding it out, just like my Pop and my family did. Owners who are working their guts out to make ends meet – who are making the sacrifices at their own dinner table so they can make sure they don’t miss payroll for their employees. I understand how hard it is – my family has been there – I have been there – and maybe you are part of the 43 percent of small business owners right now who consider growing revenue to be their top challenge they are facing. And that 43 percent equates to 12 million business owners in this country who are challenged with growing revenue. My word. Something needs to be done about that number, don’t you think, Onward Nation. That’s too many businesses and too many families who are risk. I’m committed to driving this number down – it is a worthy goal and I am just now realizing that is has been my life’s work – but – now that I am hyper focused on the problem – watch out. This is going to be awesome. I have discovered my “Why” – as Simon Sinek would say. So this solocast is the first of a brand new 3-part series that I am dedicating to providing you will critical lessons and the practical and tactical tools you need to change the game for your business. To grow revenue in unique and different ways. To give you a competitive advantage and distinctiveness like no other company in your industry. So for today…I am going to share two lessons that I learned directly from my time with Christopher Lochhead, one of today’s leading authorities on the topic of how companies can become what he calls a “Category King.” Chris was my exceptional guest for Episode 448 of Onward Nation. But before diving into the category design and category kingship – let me first share some context about Chris and why the lessons you learn from him will be a game changer for your business. Chris is co-author of the book, “Play Bigger: How Pirates, Dreamers, and Innovators Create and Dominate Markets.” Chris is also the host of the Legends & Losers podcast. Chris is a retired three time Silicon Valley public company CMO, entrepreneur and category designer. I smiled when I learned that Fast Company Magazine calls Chris a, “Human exclamation point” and The Economist (my favorite magazine) calls him, “off-putting at times”. When you listen to 448, you will get Chris’s first-hand perspectives on grit, persistence, and the challenges he had to overcome on his path to success. He is remarkable and it was an honor to learn from him. I also recommend you go to Amazon and pick up a copy of Chris’s book because it is excellent. Plus, come on…any business book that also blends in something about pirates, well…I am totally game for that. 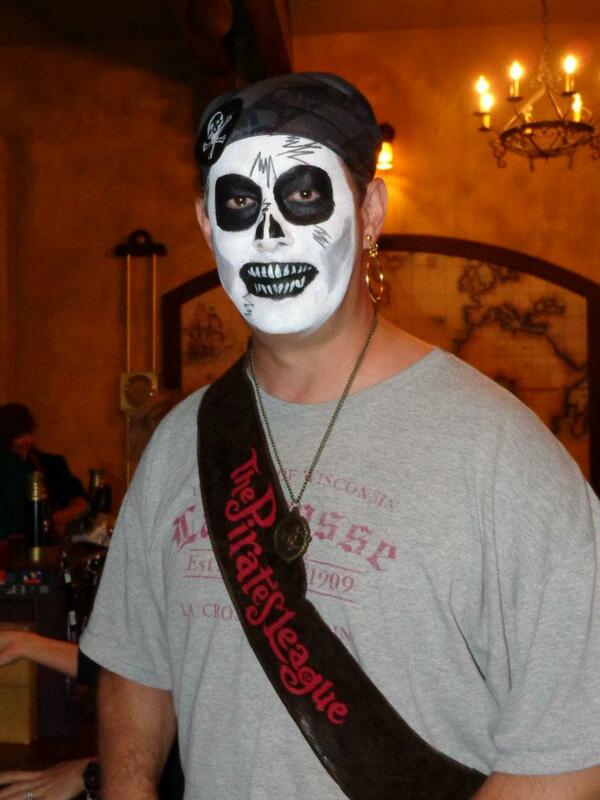 Okay, here’s a quick, personal side note…you likely know that Disney World is my favorite place on Earth – and – yes, I actually do have a thing for pirates. Aye. So…if you want a good laugh…go to the show notes for this solocast and you will see what I mean. Yes, that is actually me in the photo. That is all I am going to say right now about pirates. But feel free to hit me up on Facebook or Twitter and let me know how hard you laughed when you saw the photo! So Onward Nation – when you focus on becoming the king of your category – or better still – creating a brand new category – you control the economics of your industry, your sales pipeline gets filled with so much opportunity it is difficult to contain, and you enjoy a market leadership position that gives you the power to price yourself how you want to price yourself. Interested? Let’s dig into the first lesson that I learned from Chris. Lesson #1: You control the game when you are the Category King. Onward Nation, we live in an increasingly winner-take-all kind of dynamic in business. 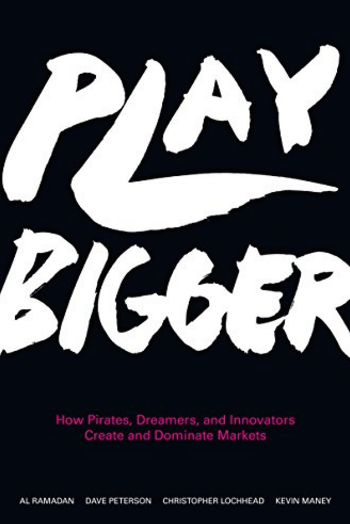 For their book, “Play Bigger,” Chris and his co-authors analyzed every tech company founded from 2000 through to 2015 that received venture capital funding. They crunched the numbers, Onward Nation, and their findings were staggering. In the tech industry, 76 percent of the market cap, or the total value of all of the companies in a given category, is owned by the Category King. But Chris and his co-authors also talked to a lot of other people outside of tech for the book, too, and as you might imagine, they told them that the winner-take-all dynamic they had uncovered in tech was happening everywhere. So Onward Nation – the research Chris and his co-authors did showed with clarity that we as business owners must figure out how we can design and dominate our industry so that we become the Category King, not somebody else. And then whatever we face in the world, whether it’s an opportunity or a threat, these are the only two levers we pull. That is our toolbox…that is our arsenal. We essentially pile on more features…make a better product…make it faster…make it cheaper, etc. We think scaling the company will do it. So we hire more sales people, it more geography…we apply a better business model…we sell on the Internet…we open more physical locations…we move our operation to virtual…we go digital. But all of these variables are just components of the same two levers, Onward Nation. The product lever and the company lever. What business owners often do is they make is an unconscious decision to put their new legendary product out in the world, and for the most part have what looks and sounds a lot like a product or features conversation with customers and prospects. And those conversations sort of sound like, “Look at how awesome this new product is! It slices and it dices and it twirls and it spins,” and it does all this stuff. But, when you study what did Steve Jobs did, and what Mark Bennioff, the founder of Salesforce.com did, and what did Henry Ford did, and what did Clarence Birdseye did…as Chris and his team did…you begin to realize is they pulled three levers…not two. Chris and his team uncovered how Jobs and Ford absolutely got legendary product and company down — but the third lever they pulled – was that they didn’t do marketing in any traditional sense that most business owners would consider as marketing. Instead…they sort of understood intuitively that they would need to condition the world or educate the world to think about a problem in a different way…and therefore…the world would demand a solution…that Jobs and Ford would then be happy to provide in the form of their product. But right now – the problem we have in business today is that we have too many solutions without a problem…and the end result is…43 percent of small business owners are facing the same top challenge…how to grow revenue? For example…in 2001 Microsoft launched the Tablet PC. Microsoft was the first big company to launch a tablet computer. But, it didn’t go anywhere because for the most part Microsoft had a features discussion and the world didn’t understand what problem those features solved. But, when Apple launched the iPad, Steve Jobs stood up on stage, at the big Mac Developer Conference and he puts up a slide that on one hand has a picture of the iPhone and the other has a picture of the iMac, and then there’s a hole in the middle. Then he begins to paint a picture with something you could call a point-of-view about how the PC and the phone are actually not great for consuming rich content, and they’re not great communication platforms for the new social, mobile world. That argument opens our minds up to thinking about the possibility of a third device…the iPad. Boom – a category is created and Apple is its King…because the market demands that of them. The Chris shared another example with me. This time, he chose Sara Blakely…the founder of Spanx. Spanx has become an incredibly successful company and product line because Sara made a very important decision. When Sara launched Spanx she did not tell the world that what she was selling was underwear. And, she didn’t call it a “Girdle 2.0”, either. Instead, she said, “It’s a new kind of under garment called shape wear.” In so doing, she distinguished the difference between all that had come before her and her innovation because she understood that if I don’t explain to the world what problem this solves – and why that problem matters – they’re not going to want my solution. When she had no money, she no relationships…she cold called buyers…but she had grit. So she designed that first, initial prototype and she wore it to meetings to try to get buyers interested and then holy bananas, she wound up on Oprah after gritting it out, but yet she didn’t tell anybody in Oprah’s network that she was going to have to make them, pack them, ship them all out of her apartment. How in the world was she going to be able to meet the demand? But she found a way. And now she’s a billionaire. She created a category and then worked her guts out to make her dream a reality. The magic thing that Sara, Steve Jobs, or any other Category King did successfully is that prosecuted the magic triangle, using Chris’s words. That is to say, they get product, category, and company right. That leaves us with the question, Onward Nation, “How do I make it my time?” So let’s move on to Lesson #2. Lesson #2: Position yourself or be positioned. This lesson is what category design is fundamentally about. For a tangible example…let’s take a look at Muhammad Ali. He brilliantly controlled the positioning of his own brand. 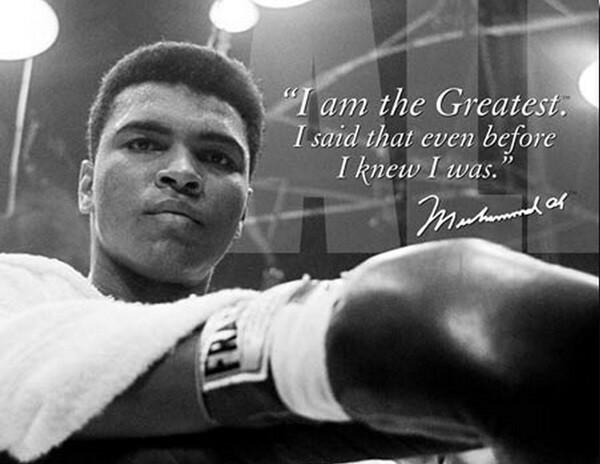 We knew he was the greatest – because Ali wasn’t afraid to tell us what category he was in. It was the category of “The Greatest” and it was a category of ONE. And because he WAS the category – he controlled the economics of that category and everyone else was simply an inferior competitor. The categorization of companies and brands is a continuous thing. We as humans put everything, products, companies, services, and even other human beings into buckets in our head. Chris then shared a very tangible example with me. In 1999, Michael Dell was one of the most celebrated entrepreneurs on planet Earth. He was running an incredible company called Dell Computer. He was on the cover of Fortune Magazine and Multi billionaire, etc. You probably know the story, Onward Nation. However, if you roll the clock forward today, Michael Dell could walk through Times Square in New York City and go unrecognized yet he still runs the same company and he still sells the same kind of products that he sold back then. But now the company is in a lot of trouble. Had to do some horrible reverse engineering and merge with other companies and it was really fighting for its life. The cloud, virtualization, social, mobile and all the things that we today take for granted came along, and made laptops, desktops, storage and servers not that important. In other words, the market shifted from where Dell was to where it is today, and that’s what legendary category designers do. They take a different approach to educating the world, to shift the world from the way it is to the way they want it to be. In so doing they open the world to a new problem and a new solution. When that happens a new category emerges, and if you prosecute the magic triangle, as Chris likes to say, you can get two-thirds of the economics in your space. When that happens you get to hang out with Sara Blakely. Even companies that we think of as exceptional marketers, like Disney, struggle in getting category right. For years, and still to some degree today, is struggling with how to position Animal Kingdom. One of the things that drives Disney crazy is when people refer to Animal Kingdom as a zoo, and their defense back has been, “It’s not a zoo,” and they’re trying to make it not a zoo, and now they’re finally getting traction, and that park is well over a decade old. So, Onward Nation, if you don’t tell people what you are then they’re going to apply whatever filter – or bucket — to what you do. And they’re going to make that up. Then there’s this sort of discussion about all the things that they’re not, and so they go on for ten minutes trying to convince Chris they’re not a zoo. But guess what Chris is left with in his mind after all that convincing? That Animal Kingdom is a freaking zoo! Or you’re a Zoo 2.0. “2.0” is the word we put after things we don’t know. If you want to stand alone, and declare your product, your service as a true innovation then by definition it’s got to be a new category. Onward Nation, we accept other people’s thinking about the world, about our business, about our life. 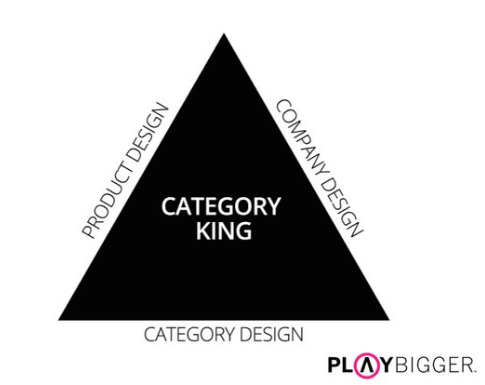 Category design really is trying to say to the entrepreneurs and the innovators in the world, every market or category got designed by somebody, either intentionally or on purpose, and the minute you position yourself, your company, your product inside an existing category, you are playing their game. In other words, you are living in somebody else’s thinking about how the world should perceive the value you provide — and particularly — the problem that you are solving and why solving that problem matters. Another example is Netflix vs. Blockbuster. In so doing Reed hacks the future, he changes the future, he creates by reimagining the problem called how do I get video into the home, and teaching us to think about how he thinks about it we all accept his problem definition, and therefore his solution. Conversely, Blockbuster went bankrupt because they couldn’t solve the problem and now Reed Hastings is one of the most successful entrepreneurs in the consumer Internet today. Our job as leaders, as entrepreneurs, is to create the future of our choosing and not to accept somebody else’s definition for how things should be. Legendary innovators do not leave their market category to chance. They don’t do marketing. They don’t do traditional marketing, Onward Nation. They articulate a point-of-view, and that point-of-view evangelizes a problem, and when that resonates with customers and it resonates with people at scale…everything changes. Once the world sees the problem the same way you want them to, Onward Nation, they cannot un-see it. Then they have to have YOUR solution. You become KING. Well, that’s what Henry Ford did. Legendary category designers understand that on the one hand you’ve got to meet the market where it is because if he had said the word “automobile” the world would not have understood. It’s shapeware vs. girdle. And we wouldn’t know who Henry Ford is. But, he was a category designer. He found a way to meet the world where it was and to use language in a very powerful way…a new language. He created a new language to take the world from where they were to where he wanted them to be. 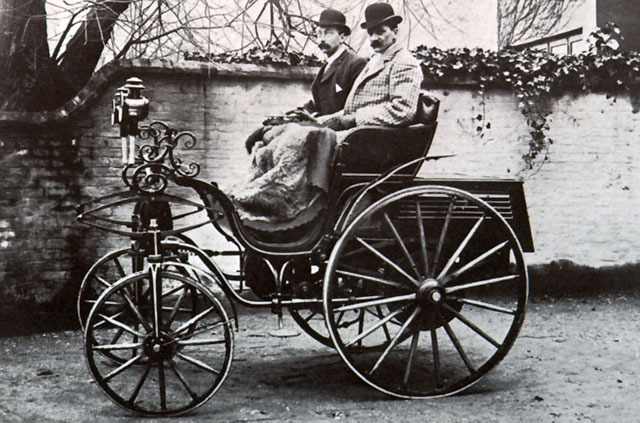 So he called his product the horseless carriage. And in so doing everybody understood what a horse and buggy was, right? Then you say horseless carriage and you go “Oh!” and the world stops. So take this lesson from Chris — think about what are things called and why are they called that, Onward Nation. When what today we call smartphones first came out, for a long time they were called, “Wireless phones.” They were in the context of what they’re not. Today they’re beginning to be described more like what they are…smartphones. And fully loaded iPhone 7 Plus, out the door is $1,000, and the reason Apple is able to do that is because we don’t think it’s a phone anymore. So, Onward Nation — pay attention to what things are named. When you position yourself inside of somebody else’s category, you are letting somebody else designed the game. And when that happens, you’re probably not in the position to take two-thirds of the economics and be the category king. Instead, Onward Nation…be intentional about category and follow Chris’ advice for prosecuting the magic triangle…and pull three levers…not the typical tow. When you do that…you will be in a position to command the economics in your category – because you will likely have created a brand new category just like Sara Blakely. With that said…I want to say thank you for being here today. I always appreciate your time and feedback. I also encourage you to download next week’s solocast – part two in our Grow Revenue series. We will dig deep into tools and the precise steps you can apply in order to fill your sales pipeline like a pro. Because like we discussed at the onset of today’s conversation…nearly 12 million business owners cite “Growing Revenue” as their top challenge. They are indeed feeling category pressure – and – these owners are searching for answers on how to generate the right number of leads, from the right type of prospects, to buy the right service, at the right margin. So, I am focusing next week’s solocast on providing you with the right tools and insights you need to solve those challenges. In the meantime, you should also visit OnwardNation.com/webinar and register for the free workshop I am teaching on March 23rd that will take a deep dive into how you can harness the power of LinkedIn to generate a steady stream of well-prepared prospects flowing into your business.